As both a woman of science and a believer what some might call “woo woo” practices, my daily routine integrates bits of both realms. The place where woo woo and the scientific line up the best is in my daily practice of gratitude. An attitude of gratitude has been shown to have health benefits. I track my resting heart rate and my heart rate throughout the day (I wear a Garmin 735XT watch that does this for me) and when I wake up in the morning, one of the first things I do is make a cup of coffee, record my resting heart rate and hours of sleep in my training log, and then I write down what I’m grateful for. This practice, along with my new meditation habit, has not only had a visible impact on my resting heart rate (and my heart rate while I’m meditating), but it also has completely changed the way I feel and move through my day. The data backs up what I feel. The benefits of an attitude of gratitude extend beyond just feeling good or lowering your heart rate. We are going to look at exactly what gratitude is, why it’s so important, as well as my gratitude journaling method. Gratitude is difficult to classify. It’s been called almost everything - an emotion, an attitude, a moral, a habit, a personality trait, and even a coping mechanism. The latin root of the word gratitude is gratus which means thankful or pleasing. According to Robert Emmons who is a leading expert on gratitude, gratitude has two pieces. He says that first, it’s an affirmation of goodness. We affirm that there are good things in the world and that we have received benefits. The second part is that we recognize that the sources of this goodness are outside of ourselves. Many people do not truly understand the power of gratitude and rather than making a mindfulness or gratitude practice a priority, we rush around being busy, worrying, and complaining instead of stopping to take the time to be grateful. This study was done with men and women who already had compromised cardiovascular health either from high blood pressure, a heart attack, or some other type of heart disease. They used a questionnaire to rate their gratitude and more gratitude correlated with better health, better mood, better sleep, and more energy. 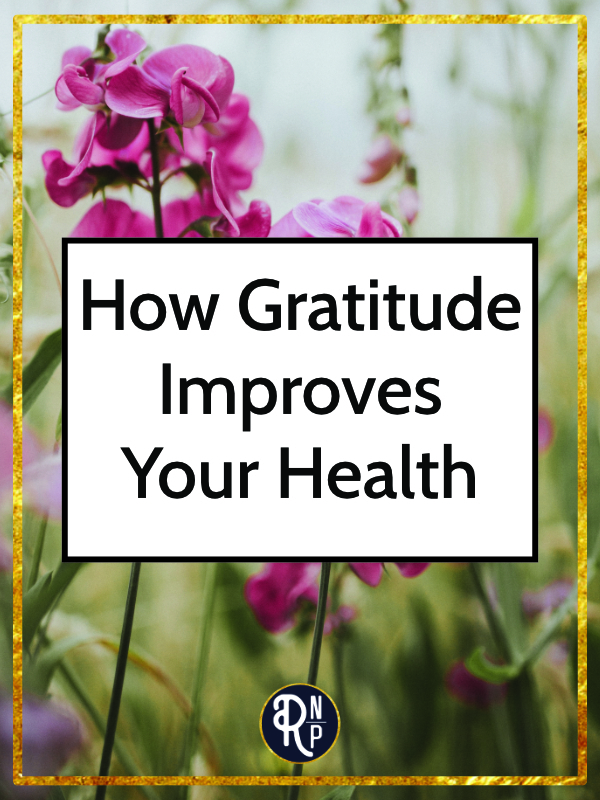 Lab work was also used and showed that those who reported more gratitude had lower levels of inflammation and less plaque in their arteries (both indicators of better heart health). The interesting part about this study is that there was a follow up study done on 40 patients who were asked to keep a daily gratitude journal. After two months these patients were reexamined and it was found that there were significant health improvements in the patients who wrote in their journals. They had lower levels of inflammation, improved heart rhythms, and a lower risk of heart disease compared to before they started keeping a gratitude journal. Another study looked at the role of oxytocin in feelings of gratitude. Researchers looked at two different interactions between couples in romantic relationships; one where he or she expressed gratitude and one where he or she received an expression of gratitude. They then looked at saliva samples for a gene, CD38, which is a regulator of oxytocin release, and found that this gene is associated with positive psychological and behavioral outcomes that are linked to the expression of gratitude. In order to determine if there was something specific about oxytocin that promotes social bonds or if it was the act of saying thank you that reinforced the bond, they asked the participants to share a personal positive event instead of saying thank you. While the participants did experience joy in this expression, there was no genetic pattern as there was in the first study. What does all that mean? It means that oxytocin plays a role in actual gratitude and sharing of that emotion, not just in joy or feeling good. Gratitude has also been found to lower blood pressure and improve sleep quality. Those who expressed gratitude more often got longer and more restful sleep than those who did not. What does this mean for your health and performance? Not only are less pain, decreased inflammation, lower blood pressure, and better sleep quality important for overall health, but they are also critical to sports performance and recovery. If the preceding 1000 words were not enough to convince you to start a gratitude practice, I’m about to give you some more reasons why it’s worth your time and energy. I also want to share with you how you can practically integrate a daily gratitude practice in your own life...because I know that a) changing habits is hard, and b) making time for something that doesn’t seem like it has any tangible benefits is also hard. Oh yeah, and you’re probably busy too and wondering how to fit it into your day. First, let me tell you that before I started this practice myself, I often found myself feeling sidetracked and scattered throughout my day. But now that I’ve made this a part of my regular daily routine (which I was also somewhat lacking before I started this practice), I have not only reaped all the physical and psychological rewards of having a gratitude practice, but I have also noticed some additional benefits. Most notably (and this is really woo-woo) is that rather than haphazardly wishing for things, I am now more aware of how those “wishes” are becoming a reality. I also feel that this practice has created some more structure in my day. I wake up, make my coffee, meditate for ten minutes, and then write down what I am grateful for. Even though this whole process takes me less than a half an hour, as I have worked to incorporate this practice into my day, it creates a signal that my day has started and it forces me to start things out on a positive note. I am not a naturally positive and upbeat person, but this practice has forced me to shift my focus from what might be going wrong to what I appreciate about the things that are going wrong and the good things. Another thing to keep in mind is that this is a practice. At first it might be really hard to come up with anything to write. Or if you’re like me, you wrote down that you were grateful for coffee, cozy blankets, and dog snuggles at least three days in a row. But it gets easier the more you practice. Beginning the day with gratitude journaling also allows me to start my day more on my own terms. Rather than jumping straight into social media, emails, chores, or a workout, I’m able to take a little bit of time to center myself before beginning my day. Starting your day slowly allows you to feel more relaxed and less stressed. There are many ways to get started with a gratitude practice. 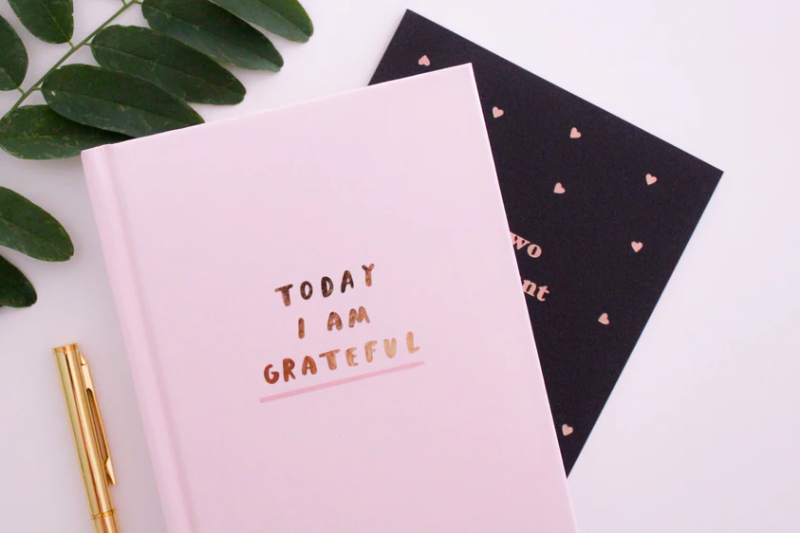 My suggestion is that you get a dedicated notebook and simply ask yourself “what am I grateful for today?” Then write down the first one to five things that come to mind. Yes, that’s truly it. It might seem incredibly simple, but that’s the beauty of this whole process. It’s simple, though not always easy. If a blank notebook page scares you, start with something like the 6 Minute Diary or this Good Days Start With Gratitude notebook. If you are looking to get started with meditation, which is something that I have paired with my gratitude practice, I highly suggest TMAC Fitness’s 4 part daily meditation. It’s simple, straightforward, and free. If you’re looking for more help there are plenty of free and paid mindfulness apps. My favorite is Insight Timer (it has the option for guided and unguided and has lots of free guided meditation options). I hope that this has helped you to understand how having an attitude of gratitude and what it can do for your health, your training, and your recovery. If you have any questions or thoughts about my daily practice or how you can incorporate these ideas into your own daily practice, leave a comment below! The Paleo NP Podcast #36: Can You Manage Blood Pressure with exercise?